Hugh Bowman has ridden Godolphin colt Plague Stone to win the Rosebud Prelude at Randwick. 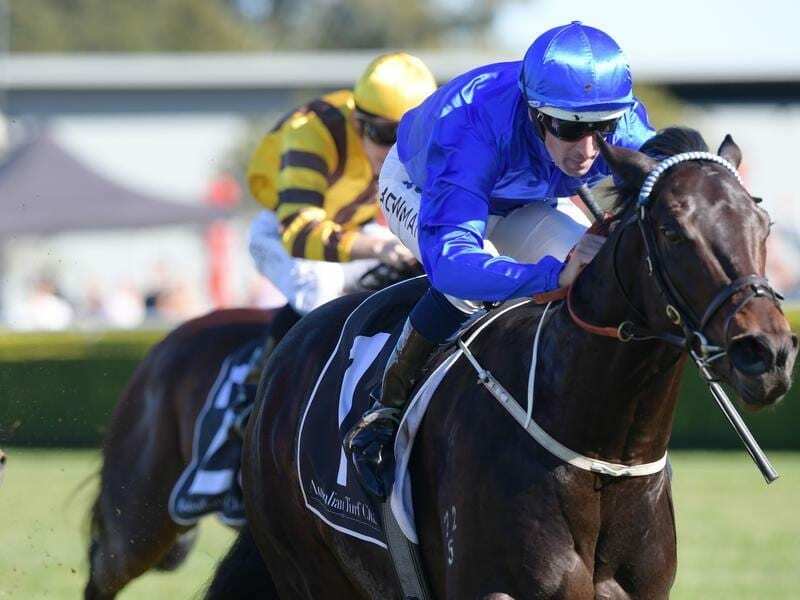 Godolphin colt Plague Stone has lived up to his early promise with a winning return at Randwick. Plague Stone’s best performance before Saturday has been his second to subsequent Blue Diamond Stakes winner Written By in the Group Three Prelude in February. Sent out the $2.10 favourite in the Rosebud Prelude for two-year-olds after two trial wins, Plague Stone made light of his 58kg top weight to power home over the top of Stakes placed filly Witherspoon ($5.50). Trainer James Cummings said the Listed Rosebud (1100m) in three weeks was the likely next step. “I liked the way he switched off and they’ve broken 34 seconds for the last 600 (metres) so that’s a good sign,” Cummings said. “He has carried more weight than the others and I like the look of The Rosebud in three weeks. “He’s beaten a stakes-placed filly in Witherspoon. The colt’s jockey Hugh Bowman agreed Plague Stone could be a force in early three-year-old sprints. “Over 1000 metres he didn’t really get a chance to show a great turn of foot,” he said.